I've finished the illustration for the feature article in the upcoming issue of "Programs and People" (for details on the subject matter and concept drawings, see below). I would have finished much sooner, but I started over at one point. Initially, I took a more serious approach to the subject. It wasn't exactly realistic, but it was closer to the style you might find in a graphic novel. Having just finished (and enjoyed thoroughly) the poster for "Art on the Green", I thought I would continue in that vein. However, problems began to emerge. 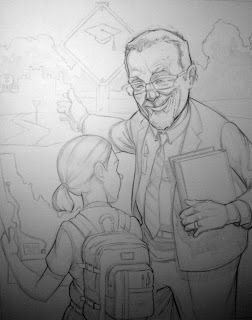 Initially, the instructor/teacher character had curly hair, different glasses, and a smirk or wry smile. But when I looked it over, the scene just looked creepy to me. I changed the face dramatically, but at that point a different problem became evident: the subject combined with the style of illustration I had chosen resulted, in my opinion, in an overly sincere feel. Nothing I could think of would have saved the piece from looking saccharine.